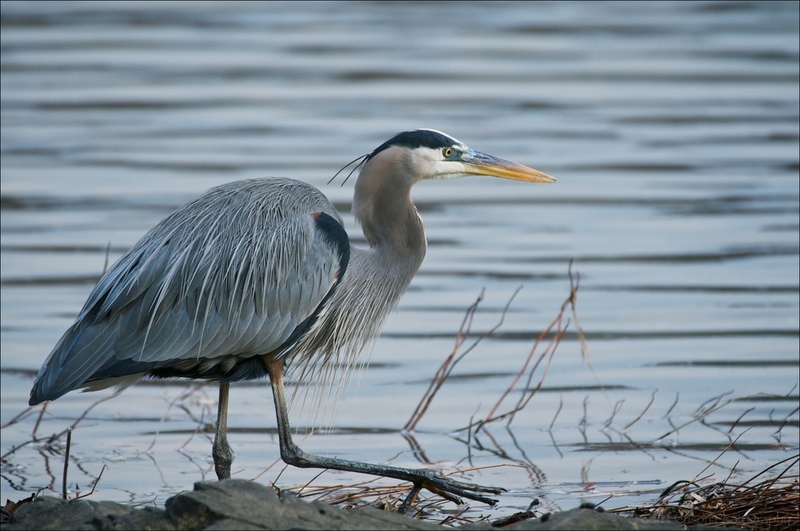 The Great Blue Heron is a large, magnificent heron, often seen fishing in swamps, marshes, lakes, rivers, or other bodies of water. I have seen streams with a heron seemingly every hundred feet or less. I most often see them fishing alone, sometimes chasing away other herons or egrets that move too close. Great Blue Heron are easy to identify. They are perhaps the largest of the herons or egrets in North America, and likely the most common. Their body is primarily a blue/grey with black and white accents. 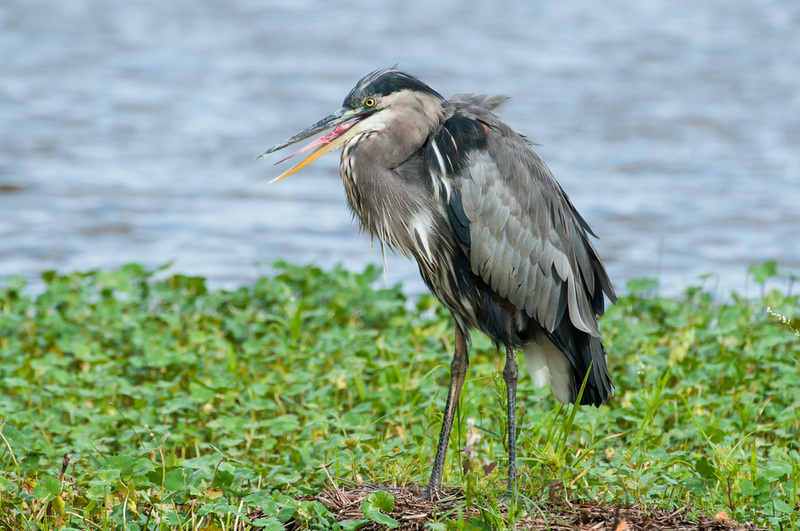 Great Blue Heron have long legs and long necks. Their necks are often folded into an "S"-like shape, especially when in flight. As with other heron and egrets they can have beautifully detailed plumage on their backs, under their necks, and on their head. The male and female Great Blue Heron look alike. 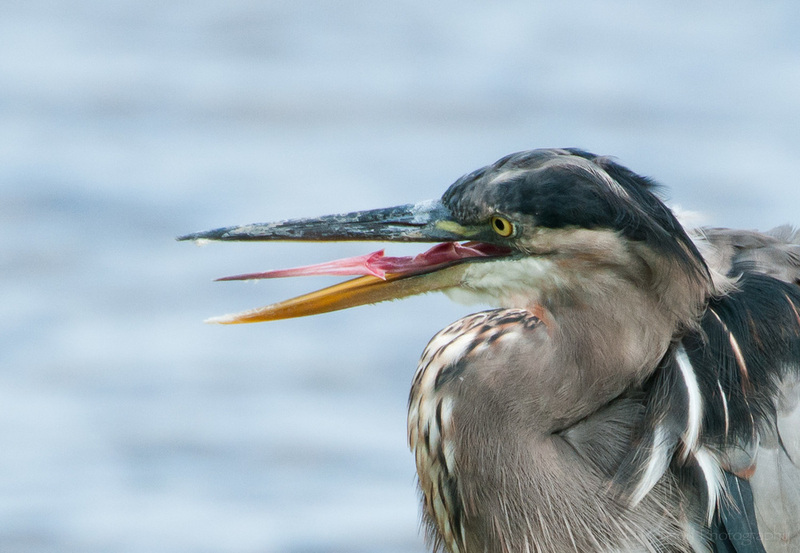 Great Blue Heron, as with other heron and egrets, are very skilled and patient at fishing. They will sometimes stand perfectly still for long periods of time. When fishing near waterfalls it's possible to create photos of them using slow shutter speeds to blur the water and still keep the heron in focus. Great Blue Heron chasing away Herring Gull from a fish the gull had been feeding on. Once the heron showed its dominance it wandered back to its nest and left the gull to eat the fish. Great Blue Heron in flight. Notice the coloration on its underside.